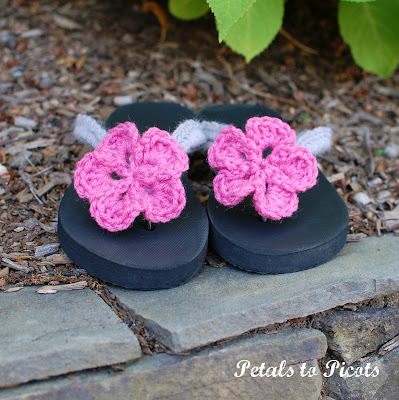 Last week I shared this Crochet Flip Flops Tutorial on how to dress up a plain ol’ pair of flip flops with a little crochet. 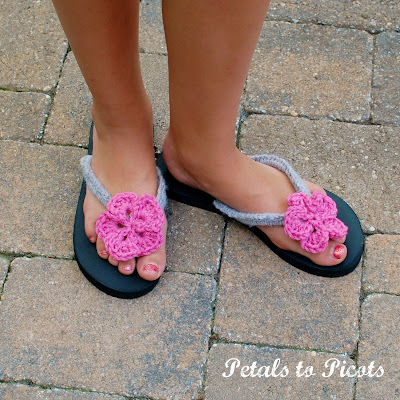 My oldest daughter loved how they came out and how comfy the feel of the yarn was on her feet instead of the plastic strap. So of course my younger daughter asked for a pair too! I am happy to report that she is thrilled with how they came out and has been wearing them everywhere. Want to make your own? Click here for the tutorial. Sew cute! (Pun intended.) I’m hosting a linky party “One Creative Weekend” at OneCreativeMommy.com. I’d love for you to visit and link up this idea and/or anything else you’d like to share. Love these! I bet they feel so much softer. 🙂 Pinning it. Kara!!! Those are adorable!!! And I’m positive so much more comfy! They are cute and hip! And your tutorial is great, thank you so much for sharing it!! Oh my goodness! These are completely adorable! I love them! My Grandma Gosney taught me to crochet when I was 10, but I never really got past making scarves and dish cloths…I think I may have to take a class soon! Those are too cute! Thanks for sharing the tutorial. My girls will love these! What a great idea!! Thanks for sharing the fantastic tutorial! !